Relax and unwind in a luxurious holiday home with its own outdoor hot tub. Bathing in your hot tub is the perfect way to cap off a fun-filled day. Even as you’re out enjoying the best that Devon has to offer, a large part of you will be just itching to get back for your evening soak. Our hot tub holiday homes all have private decked balconies complete with garden furniture. 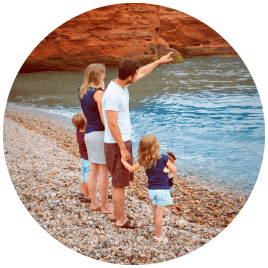 You’ll also have easy access to all the facilities of our family-friendly holiday park, including our private beach. Of course, that’s not to say these holidays are all about the great outdoors. Our hot tub holiday homes are luxuriously appointed with all the comforts of home. They’re all centrally-heated and double-glazed, and bed linen is supplied. Located in a prime position on the front row with your own private hot tub and a large balcony overlooking the sea. This luxury holiday home is a firm favourite. A pet friendly holiday home with a large private balcony and hot tub, offering stunning sea views across the Jurassic Coast. With laminate flooring throughout it’s an ideal retreat for pet lovers. *Please be aware that hot tubs can take 8-12 hours to heat up.